BEST WESTERN Le Strange Arms Hotel at Le Strange Arms Hotel01485 534411work Group AccommodationThe 4* Le Strange Arms Hotel has 43 individually decorated en-suite bedrooms, many with beautiful sea views. The restaurant overlooks the lawn that runs down to a wonderful sandy beach. Adjoining the hotel is the Ancient Mariner Inn with its own restaurant serving good food, wine and real ale. Just off the A149 in Old Hunstanton. GROUP TRAVEL FACILITIES: Group size - min 10, max 120, 7 singles, 34 twins/doubles, 2 family rooms, coach parking on site, themed breaks, travel agents bookings accepted, evening meals for groups, special diets available, languages spoken, disabled facilities, lift, conference facilities, driver/organiser incentives, pre-booking required. 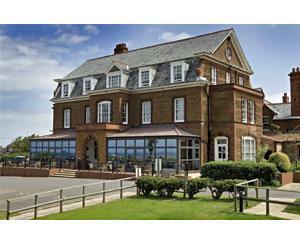 The 4* Le Strange Arms Hotel has 43 individually decorated en-suite bedrooms, many with beautiful sea views. The restaurant overlooks the lawn that runs down to a wonderful sandy beach. Adjoining the hotel is the Ancient Mariner Inn with its own restaurant serving good food, wine and real ale. Just off the A149 in Old Hunstanton. Single supplement: No supplement on the first six rooms booked.